Here are the cards we'll be making this week in Class on Wednesday, February 8 at 7pm. if you'd like to attend class and make these beautiful cards! This first card features the new Twitterpated Designer Series Paper from the Occasions Mini, as well as the Mixed Bunch Stamp set and coordinating Blossom Punch. 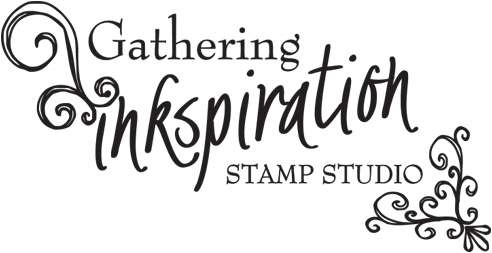 I received the Mixed Bunch stamp set at Stampin' Up's Leadership Convention last month - this is one of those sets that I fell in love with as soon as I saw it in the new Mini catalog, so I was thrilled to receive it for FREE at Leadership this year :). We added a strip of the Riding Hood Red Pleated Satin ribbon (which can also be found in the Occasions Mini) behind the flower and finished the flower off with one of the 2010-2012 In Color Glimmer Brads - what fun! The "Thanks" stamp is from the Thank You Kindly Stamp set in the Idea Book & Catalog. We used a Basic Gray marker to ink only the "Thanks" portion of the stamp. This next card is a CASE from the Occasions Mini. It also features the Twitterpated Designer Series Paper and a Baja Breeze card base. We embossed the heart (using clear Stampin' Emboss powder) from the P.S. 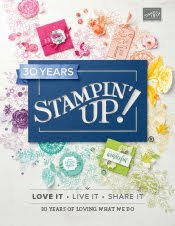 I Love You stamp set (from, you guessed it, the Occasions Mini!). 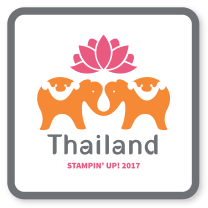 The sentiment, "i love the "u" in us", is also from this stamp set. This stamp set features 15 great Valentine stamps - it was a must-have this year! I've used it in so many card and projects this winter - I love it! We used more of the 3/8" Pleated Satin Ribbon - this time in Blushing Bride. I loved the way it "curved" on the card front! Finally, we added a couple more hearts using the Fashionable Hearts Embosslits Die with the Big Shot and a Basic Rhinestone Jewel. I was thrilled to use the new (again, I know! - they had soooooo many cool new products in the Occasions Mini!) Hearts Collection Framelits Die with the Big Shot - we made the largest heart (without the scalloped edge) in Basic Black and the next largest heart with the First Edition Specialty Designer Series Paper. I also punched a small Cherry Cobbler heart with the Heart to Heart punch and added a few Basic Pearls to it. The Cherry Cobbler layer is embossed with the Vintage Wallpaper Textured Impressions Embossing Folder with the Big Shot. We stamped "Happiness" on the card and "Forever and Always" on the inside of the card using the Loving Thoughts Stamp set (another set from the Occasions Mini that we received at Leadership last month)! For a final touch, we added a strip of Very Vanilla 5/8" Satin Ribbon - such an elegant ribbon! This last card features the Everyday Enchantment Designer Series Paper and Brads. You can get either the Paper or Ribbon & Brad Pack for FREE right now with a $50 order. 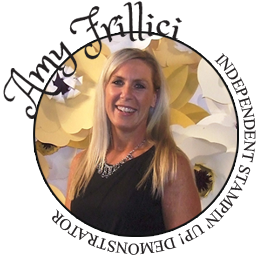 Just email me today at amy.frillici@yahoo.com to get your free Sale-a-bration products, too! We punched the DSP with the Postage Stamp punch, adhered it to a square of Very Vanilla card stock, then ran it through the Big Shot with the Square Lattice Textured Impressions Embossing Folder. 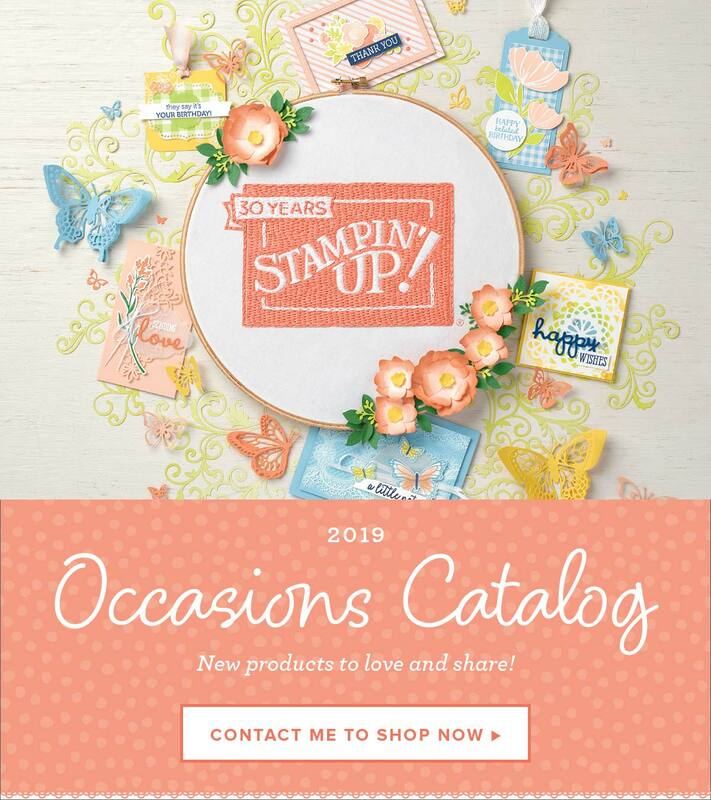 We also stamped "Hello" in Pear Pizzaz using the Elementary Elegance stamp set from the Sale-a-bration Catalog (another stamp set you can get for FREE with a $50 order!) and punched it with the Curly Label punch. We added a few butterflies from the Beautiful Wings Embosslits Die. Finally, we added a "bow" with the Pool Party Seam Binding ribbon - one more new product in the Occasions Mini - and the Everyday Enchantment brad (in addition to the Brad pack, you also get two bolts of 1/8" Organdy Ribbon is Calypso Coral and Lucky Limeade with this Sale-a-bration pick!). As always, I hoped you enjoyed these cards this month!! I have lots more new ideas for next month as well. If you can't join us this month, please feel free to join us at my next Card-Making Class on Wednesday, March 14 at 7pm. 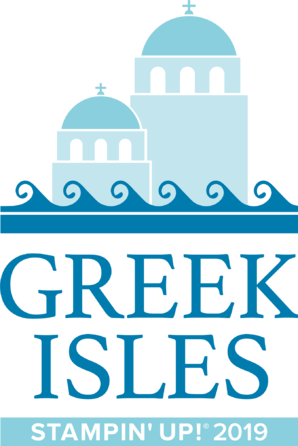 This class meets the 2nd Wednesday of every month! Just email me at amy.frillici@yahoo.com or call me at (989) 330-0259 for additional details! Hope to see you soon! Valentine Treats - For Sale! !